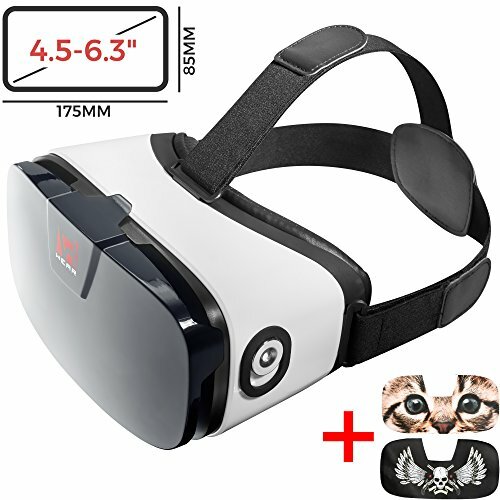 VIRTUAL REALITY AVAILABLE - A new high-quality VR Viewer from VR WEAR for the great experience of plunging into a video, game, educational or entertaining program, a virtual tour or trip. Enjoy a panoramic spherical 360 degree video or watch films with IMAX cinema effects and more. VR HEADSET WITH MAXIMUM POSSIBILITIES - Our VR accessories have a comfortable lens adjustment in 4 directions for EACH EYE separately - adjusting the focus and IPD (interpupillary distance). A high-quality big lens with an increased 105 degree vision angle for more precise image and the reduction of dizzying effect. EVERY DETAIL IS WELL-THOUGHT-OUT - For extremely comfortable use, the adjustable headset has a hole for an earphone or charger cable, a hole for ventilation, which is necessary for the smartphone not to overheat and the lens not to get foggy, and a semi-transparent lid for camera - additional reality (AR) provided. REALLY COMFORTABLE TO WEAR - The light construction of the VR headset gives it a comfortable fit: it doesn't press on the nose, and there are adjustable straps which can be tightened or weakened. With the help of 2 sticker sets included in the kit, you can change the look of the virtual reality goggles as you like. GIFT IDEA - The VR goggles with head strap is an original gift for anyone who likes new technology and gadgets. Looking for a holiday gift for a boyfriend, husband, friend, son or daughter, or a colleague (well, for anyone)? Give your loved ones a virtual reality headset. What can be cooler? If you have any questions about this product by VR WEAR, contact us by completing and submitting the form below. If you are looking for a specif part number, please include it with your message. Virtual Reality Headset 3D VR Glasses by Voxkin – High Definition Optical Lens, Fully Adjustable Strap, Focal and Object Distance – Perfect VR Headset for iPhone, Samsung and any Phones 3.5" to 6"